What Steps Have You Taken to Evolve Yourself, Your Work/Business and Your Organization	into More Purposeful, Impactful Work? 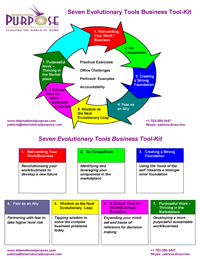 The focus of our Seven Evolutionary Tools is to explore and develop the attitudes, capacities and emotional intelligence necessary to function within an expansive work model needed in our global society. This Model assists leaders, teams and individuals to become more self-aware, proactive and entrepreneurial, with the ability to take greater risks and gain sustainable results. Recognize the beliefs and mental models holding you back and those that will evolve you beyond your vision. Build capacity toward exponentially greater potential at the level of self, work/business and organization. Develop internal tools/mechanism so you become a master of your own destiny. Assist in overcoming personal and institutional resistance toward greater resiliency and risk-taking. Solve complex problems through an expanded decision-making approach Ð tapping your head, heart, wisdom and greater humanity. Think and act from a sense of urgency, being more proactive, strategic and futuristic. Envision and plan for a more innovative work purpose, vision, mission and strategy that is future shock-proof.